Best spoke shave for the lowest price? Once again I come to the people who might know? I have an old spoke shave that I’ve cleaned up. Been watching Paul Sellers and finding out lots of great hand tool advice. I live a long way from anyone who can help with this question. I’d like to purchase a new spoke shave. although they look simple there are subtleties. So In my poverty I’m asking ”What is the best for the least?” LOL! As always I appreciate you comments and humor. used them for years with no major complaints. a weak spot in the design. like a drawknife than most cast shaves tend to be. Thanks for educating me. LOL! I have thought of purchasing one myself many times, just not sure which is better. I will watch with anticipation. Meets Andy’s Critera. and it’s cheap enough to toss if it doesn’t work? you know what they say, you get what you pay for….. Try Brtish ebay stanley, record, preston clifton etc. cheaper than american ebay. You also get what you can afford to pay for? LOL! Did you see the reviews? I’ve seen those Tom and some similar on e-bay. Probably too cheap to work worth anything. Stanley 151. Your question has been answered. These two items totaled $1. 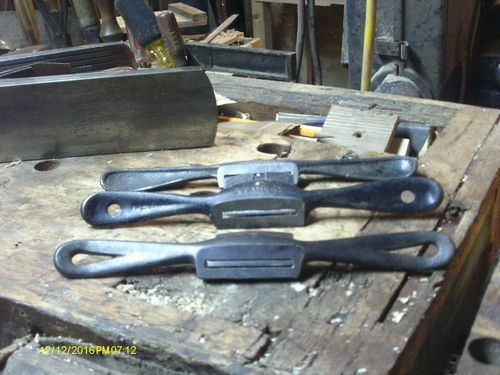 Spokeshave is a S. Smith & Son. Also have a $1 Stanley #64 shave, the two are just about the same. You can go on Ebay and find the same ones every week. I used my two to finish rounding leg blanks into round rocker posts. Worked just fine. The three I have, F-R: Seymour Smith & Sons, Stanley #64, and a no-name.. The No-Name actually does a decent job….all are flat bottomed girls, though..
Once again I come to the people who might know? 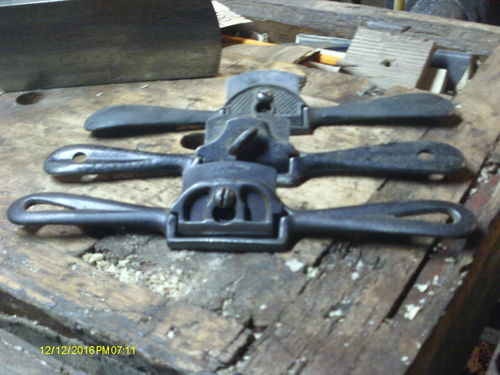 I have an old spoke shave that I ve cleaned up. Been watching Paul Sellers and finding out lots of great hand tool advice. I d like to purchase a new spoke shave. although they look simple there are subtleties. So In my poverty I m asking ”What is the best for the least?” LOL! 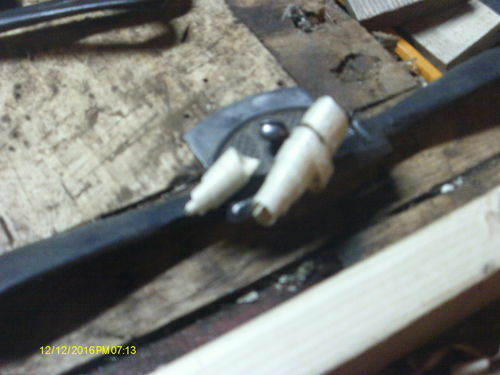 I suggest a spokeshave kit from Veritas and make your own. Cost is very nice and you just cannot beat a quality tool made by yourself. Looking at critical reviews of spoke shaves and pricing. Shipping as well. Stanley on Amazon had least critical reviews. LOL! Ebay pricing slightly higher. Spoke Shaves blades are also to be considered. 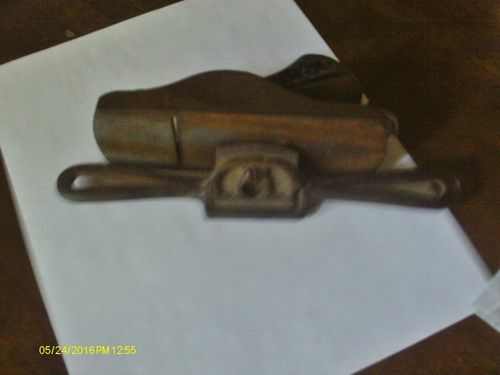 I bought a cheap modern spokeshave by Stanley on Amazon. Works well once I tuned it up, but I’ll end up buying a new blade for it at some point, as the factory blade won’t stay sharp. But for getting started, it’s the cheapest way in, as long as you also have a hand-file so you’ll be able to tune it up. Took me a couple hours fiddling with it to get it right, fixing one problem at a time, then making a shaving or two, and figuring out and fixing the next problem.